Hello from New York, where I am enjoying some breakfast in the lovely hotel room I booked on Priceline. No, room service didn’t bring that cookie. I had to schlep through Grand Central station in my pajamas to buy breakfast. Nobody gave me a second look. Ah, I love New York. I’m here vacationing and since I don’t have an iPod or even a real grown-up laptop, I’m borrowing the computer Fuzz won in the Draw Yourself Sharing a Lactaid Moment contest. It’s not as powerful as the one I have at home, so editing and uploading photos is a challenge. Answering comments is also a slower process, but I’m doing my best. If I skipped yours and you are frustrated that I didn’t respond, just email me directly using the anna at cookiemadness dot net address. Anyway, thanks for stopping by, Saturday readers! I remembered my camera this trip and will try to take a picture or ten later today. This morning, I am going to do some shopping! Can’t wait to hear, Anna. ARE YOU MAKING A POLITICAL STATEMENT? I hope not!! I agree with Katrina. JT and Levain both have excellent cookies, but the two are too different to be compared. Silver Moon Bakery north of Levain also has a good cookie, although not as amazing as JT and Levain. And, Anna, if you happen to be on Bleecker between 6th and 7th Ave. you should check out Rocco’s paticceria. It’s a dessert lover’s dream. Across the street, Amy’s Bread makes the moistest, softest chocolate cake I’ve ever had and Murray’s Cheese has a surprisingly good chocolate chip cookie (although I noticed that it tends to be overbaked in the evening as opposed to during the day). And, of course, Jacque Torres’ Chocolate Haven is not too far away. Oh, and if you are near Columbus Circle you should try a bouchon at Bouchon! I can’t believe how close you are. Enjoy your stay! So…are you back? What are the highlights of your trip? Do tell! Miss your baking/ideas/stories…when are you coming back to us???? I’m so jealous — I love NYC! 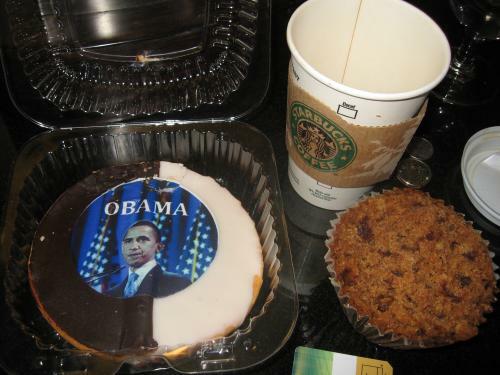 We’ve got Obama and McCain cookies being sold in our neighborhood bakery too. They’re keeping tally of the numbers sold of each. We live in Texas, you can guess which one has the highest count. Yes I love NYC and the fact that many times I have walked in my bed clothes across the street or down in the hotel lobby to get my morning fix at Starbucks. I miss NYC. Walking around Grand Central station in your pj’s sounds like amazing fun! I wish I was with you! Ooohh have fun in NY trying out all different bakeries and patisseries :)? and Obama gets my vote because he like pie ^^! Love love love your breakfast! Nothing says New York like a black-and-white. I hope your shopping lands you in the Upper West Side (by coincidence of course!). I saw a Holiday Inn Express commercial last night – the one where the baby cuts his own umbilical cord – and I laughed so hard because I thought of your post from when you and Fuzz stayed there! Have a wonderful remainder of your trip. I made your Jumbo Double Chocolate Tangerine and White Chip Cookies today – they were great! I halved the recipe and made them smaller (still pretty big though! ), and got a bit over two dozen – I upped the temp to 375 and baked for about 14 minutes. I used half margarine and half butter, and butter flavored crisco, also subbed reconstituted dried orange peel for the fresh peel. The amount of cocoa and sweetness was perfect – congrats! Oh, it’s a perfect day to walk around the city. I live in NJ and today is sunny and cool. Bring a sweater tonight it is supposed to be very cool. Have fun and take lots of pics. I’ve had both the JT cookie and Levain’s. They are both excellent but different in their own right. I don’t think the two should really be compared. LOVE the JT for its immense chocolate and crisp outside and chewy perfect inside and LOVE the Levain for its extreme big fatness, soft, gooey middle and lots of chocolate. They are just different! Hmmm, I guess I’ll have to go back in a few weeks and test them both out again! But also gotta get to City Bakery and I hear Eleni’s at Chelsea Piers is a darn good CCC. I’m sure Anna’s feeling it the next couple days, but there’s just too many places to go and try. I’m sure she’ll do us all well. I wonder what great NYC cookie she’ll try to clone next? In your absence I decided to check out David Lebovitz’s blog and he blogged about City Bakery today. Oh my! He makes it sound like a worthwhile stop! Hope you’re having a good time! Can’t believe I’ll be there in a few weeks! I haven’t been there since 2000, I’m jealous. Lisa poses an interesting question! Black and whites, bakeries all over the cities, pizza, bagels, five star restaurants, fantastic ethnic dining choices, sigh, where’s a girl to start!? Have a blast! Fortunatley in NYC you walk a lot to burn off some of those calories! Well, here’s the question: is Levain really better than Jacques Torres? Hard to imagine. I know that Anna wouldn’t go to NYC and not get a big-fat you-know-what at LB! When she said shopping, I’m sure she meant for bakery goods, not Gucci bags and such! Right, Anna? 😉 Anna, hello, are you there? Oh, you’ve passed out on the bed after eating a cookie–I totally understand! Have a nice holiday. Enjoy it to the max!!! You’re in New York and aren’t eating a bagel for breakfast?! Hello Anna, and hello Senator–how funny, you’re only a few hours from me (I live in NJ). The Internet makes for a funny world. Is today a day for ‘that cookie?’ (the L-word, I mean). I can’t wait to get a black and white!! How was yours? Enjoy your breakfast & have FUN! shopping in the city. How long are you going to be visiting Gotham city? Have a great time! I’m so jealous… is it chilly there?